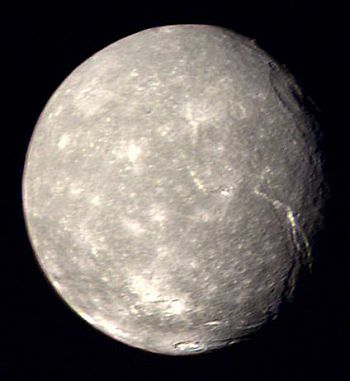 The moon Titania is the largest of Uranus's satellites. With a diameter of 981 miles, it is also the eighth largest in the whole solar system. Lying around 271,000 miles from its host planet, it is the fourth out of Uranus's five major moons. Its orbit lasts 8.7 days. The moon Titania is not only the largest, but also the densest of Uranus's satellites. This leads to the supposition that, as well as water ice, the moon contains much rocky material. If its interior is "differentiated" - that is, the rocky part is clearly separated from the water ice area, then this rocky core is estimated as having a radius of two-thirds the total moon radius. That's a large core! The internal heating mechanism of this moon is still a bit of a mystery, so the possibility of a sub-surface ocean is speculative. If there is ammonia present in its water ice, then this ocean could certainly exist. Some of the main moons of Uranus are bright and reflective, others have dark surfaces. Titania is sort of midway between these two extremes. It displays a slight reddish hue. Impact craters have a slightly bluish colour. The moon has its share of craters, though not as many as some of its neighbouring moons. A total of 15 have been named. The largest of them is Gertrude, with a diameter of just over 200 miles. Other prominent features are huge scarps, called "rupes", which intersect all over the surface of the moon Titania. Areas in between these rupes can be relatively smooth. Sometimes, two of these rupes run parallel to each other, in effect forming a canyon between them. These features are called "chasmas" and the moon has an enormous one, called Messina Chasmata. You can see it in the image here. Running from the moon's equator almost all the way to its south pole, it is around 930 miles long and up to 30 miles wide.